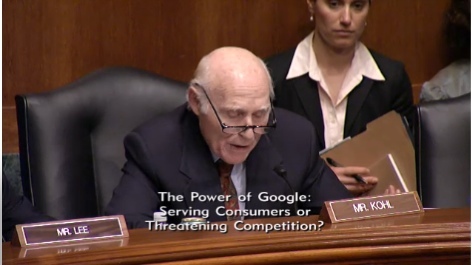 In what was purported to be Google’s stern talking-to, the U.S. Senate Judiciary Subcommittee on Antitrust, Competition Policy and Consumer Rights (breath) opened up its three ring extravaganza today, an affair that was like watching a polite yet drunken developmentally challenged quadruple amputee catch an equally polite greased pig. For 3 hours. Knowing myself well enough to know that 3 hours of this jackassery would result in my hanging myself shortly thereafter, I only dipped my toe in the stream periodically. Five minutes of that mummer’s farce – as Ned Stark would say – leaves me astonished that this country’s government allows anything productive to happen. Creighton’s total obfuscation; Franken’s embarrassing misuse of jargon. This is your government at work. 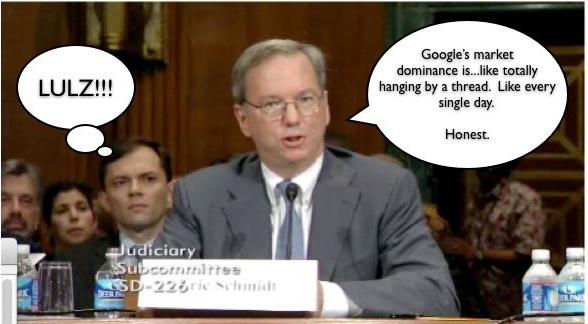 The Schoolhouse Rock version of these proceedings would resemble barnyard pr0n.